If you can name me someone who says they don't like squirrels, I can name you a liar. 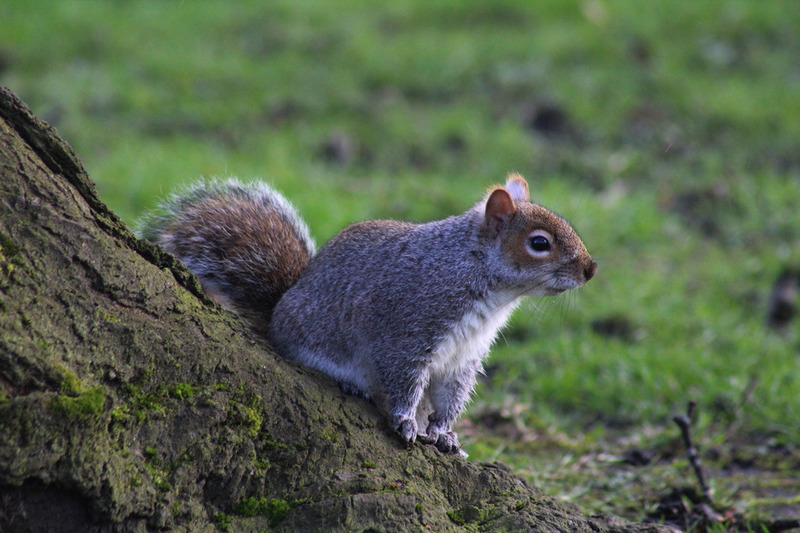 There's many a reason that squirrels, of all the animals I come across in the park, are one of my absolute favourites to snap. For a start, they're incredibly photogenic - they have big, emotive black pools for eyes, impossibly cute noses, delicate paws and extravagant tales they swish around in the bravura fashion. They do scurry and hustle around a lot, admittedly, which can make photographing these guys rather tricksome but, with perseverance, it's definitely worth the effort. Conversely, it's this propensity to keep on moving which makes them such grand subjects. As I described in my broader guide to animal photography, the two things I aim to capture when shooting wildlife are, above all else, physical features which are unique to each being or movements which define them. Aside from their obviously beautiful appearance, the thing that fascinates me most about these wonderful creatures is the manner in which they scurry, climb trees, eat and explore. 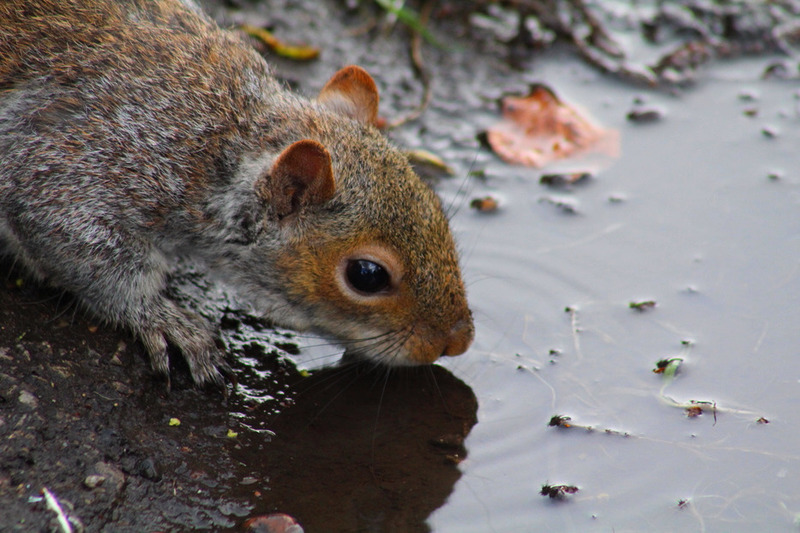 The hustle and bustle of grey squirrels' lives is absolutely fascinating. If you watch them for any amount of time, you're most likely to see them appear (often from seemingly nowhere) either in pursuit of food and water or, equally, with hoarded grub they're looking to bury to excavate in the cold winter season. 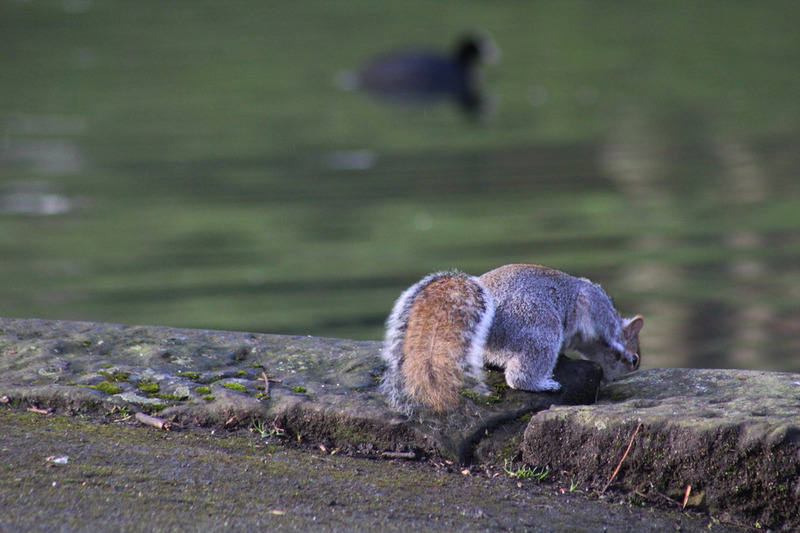 Whilst they do an incredible job of remembering where hundreds of their meals have been concealed buried months earlier, occasionally, according to Rob Swihart of Purdue University, the squirrels will forget where the seeds and nuts they have plundered are when they go to retrieve them later. This forgetfulness often leads, rather magnificently, to squirrels being responsible for new trees growing. That you can watch these charming creatures planning so far into the future provides no end of wonder for me; for people who wrongly assume animals have no inner life and are incapable of imagining abstract thoughts beyond the here and now, a few minutes in a park watching these delightful rodents planning for a future, anticipating the effects of winter, is an amazing rebuttal. So, with their physical movements, appearance and general character in mind, my aim is to translate what I see as fundamental to a squirrel into pictures. Their timidity and spriteful nature are matched only by their inquisitiveness when not frightened; in order to capture all of these things, I have to consider how to allow them to get on with their daily lives without being intrusive. So, when deciding on which hardware to take with me on my stroll around the park, a long lens is the obvious choice. This way, I can snap these lovely creatures in close-up even whilst keeping some distance. The thing I would most suggest is, before even taking a single picture, it is essential to get to know the location in which you will be shooting. 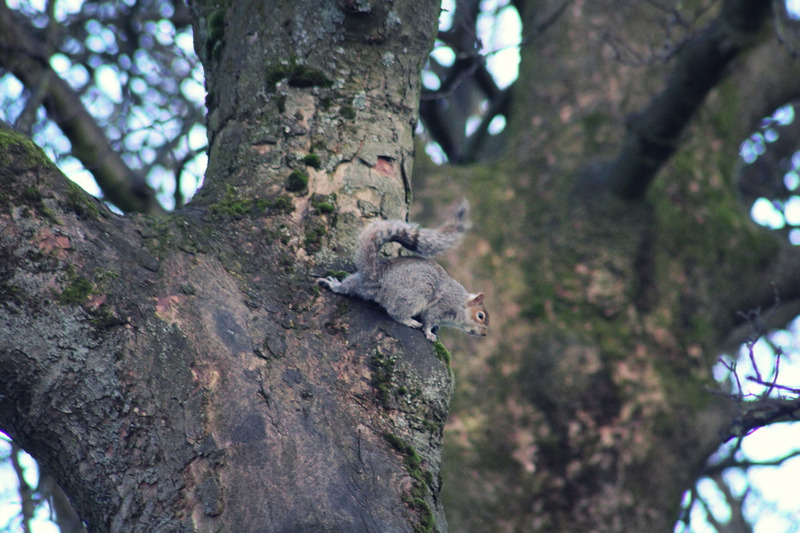 Through several strolls around my local greenery, I became aware of which animals were likely to be found in which places - the squirrels who live there, it turns out, have their local hang-outs. So, knowing this, when I return with camera in hand, I'm able to wait there for my bushy-tailed friends to make themselves known to me and not vice versa. Although I don't consider the images I snap as strictly "documentary photography" I do like to interfere and stage shots as little as possible. 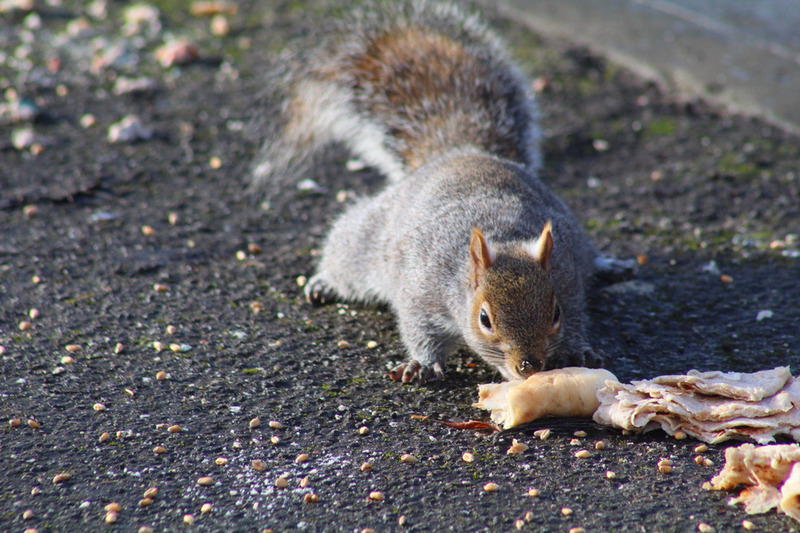 So, in the instance above where my squirrel subject, crumbs all over his nose, is sniffing out and ready to consume a naan bread, could easily have been staged had I placed similar food there myself, this was something I serendipitously stumbled across. I should also note, at this point, that whilst whoever did leave this delightful Asian cuisine for these neighbourly rodents to consume was, I assume, generally well-meaning, the empty calories found within might not be the best for any park life. I think it's a very good picture, slightly unexpected, but not something I would have been happy planting. Furthermore, too many attempts to stage a shot will tell you more about the photographers intentions rather than the actual thing they're trying to shoot. 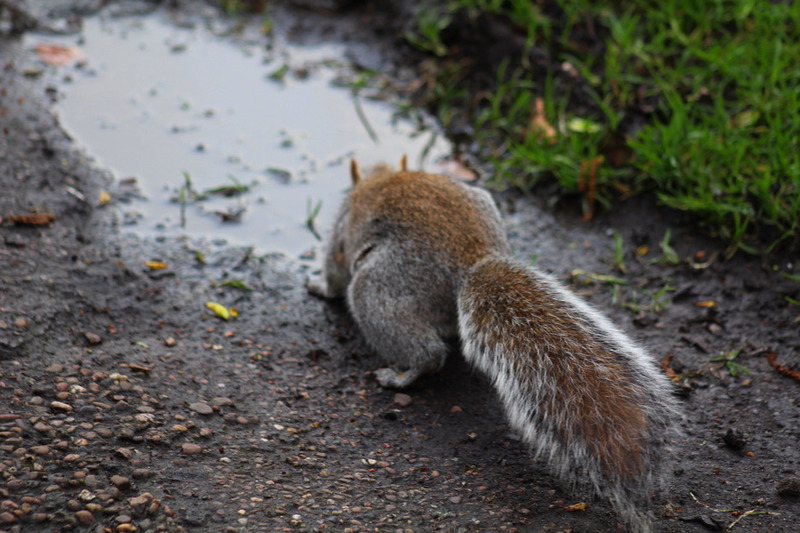 The single best tip I can give, though, for taking pictures of squirrels is to enjoy watching them. Think about what you'd like to capture when you see them and how best to frame your shots. Even if you don't succeed in shooting a crystal clear image or getting your focus perfect, the one thing you should get from an afternoon of snapping these delightful fellows is a sense of calm and tranquility. The process of taking the pictures themselves, of watching, waiting, anticipating these curious rodents, is much more worthwhile than seeing the photographs themselves.